I better check this one out. 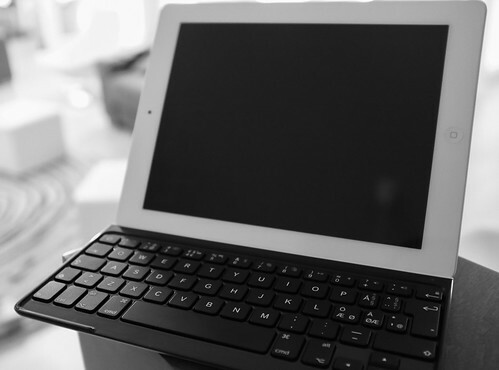 I have been looking for a keyboard that fits perfectly with my iPad as well. Thanks for sharing. One thing the mechanical keypad does not help with is basic text editing (selection, etc.) in iOS. Apple has a lot of work to do on this piece to enable an iPad to completely replace a Macintosh for people who write (and edit) a lot. Richard, at least this keyboard has special keys for selecting text. They are actually quite handy. I am not sure if you meant this kind of thing, though. Jonne: Well, yes, that’s part of it. Glad that process is easier but still, I like a mouse and OSX text editing tools for heavy editing. For me, a touch interface doesn’t have it yet. I too use a keyboard from Logitech on my iPad. I found the iPad much more convenient and useful with this simple addition; otherwise I probably wouldn’t use it ever. What kind of activities do you find yourself using the iPad for? Mine are mostly work related, though I am looking to see if I can use this one device and eliminate my need for an additional laptop. Jeremiah, thanks a lot for commenting! Actually I have been thinking for some time now to post here about using iPad as a computer substitute or using iPad parallel with a computer. At the moment it is not so easy for quite many reasons. But more about that in a future post.